Afternoon tea at The Lobby Lounge is nothing less than a fine quintessential luxurious experience, transforming tea into an indulgent treat. 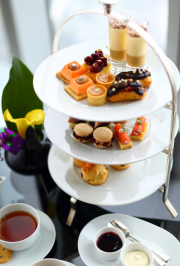 To our guest’s delight our culinary team has created a delicious Afternoon Tea menu including a selection of freshly made sandwiches, warm scones and delightful choices of cakes and pastries, all served up in fine bone china and accompanied by welcoming, flawless Four Seasons service. Served daily from 3:00 pm to 7:00 pm and priced at LBP 68,000 per person. Guests are also invited to relax to the sounds of the live piano every Tuesday till Saturday from 6:00 pm to 9:00 pm. For reservations please call 81-700644.